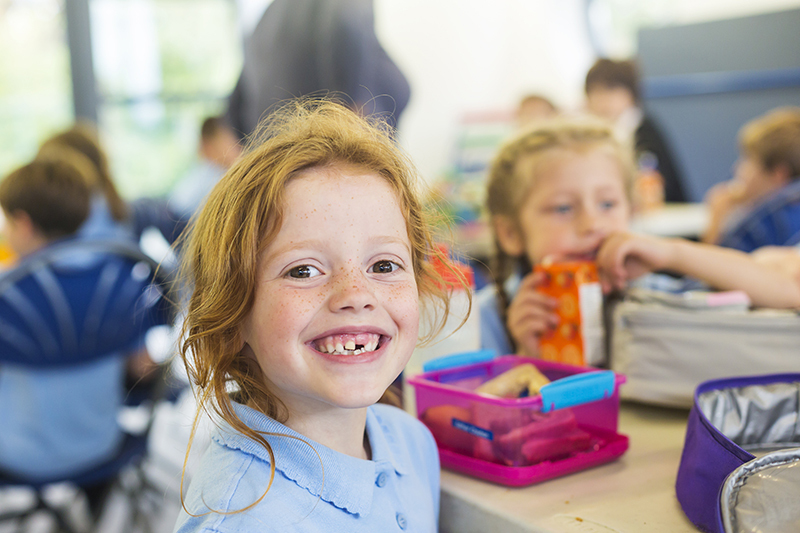 What should Australian parents pack in their child's school lunch? My big boy starts school for the first time next week. He’ll be one of the little kindergarten kids wearing velcro strap school shoes, and I will be his newbie school mum. As such, this week I have been on the ‘back to school supplies’ mission, buying drink bottles, pencil cases, whiteboard markers on the school stationery list and the like. I’ve also sorted his lunch box needs, and have discovered that when it comes to this there are a few things I needed to know. Lunch box anxiety is totally a thing! 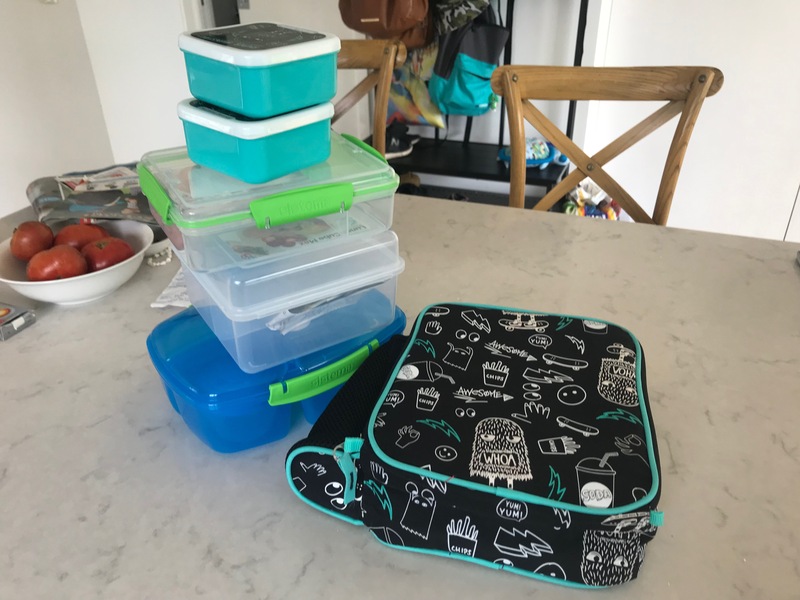 My friend who also has a child starting school for the first time, has panic-purchased three different types of lunch boxes, as well snack containers because she hasn’t been sure which box or bag is best, or if her little guy could open the boxes. Here’s a photo of her stash! What kind of lunch box should I buy? “Get an easy-to open sandwich box. Just a simple one but check he can actually open it himself before you buy it,” was her first tip. What to pack for Crunch and Sip? If your child’s school has Crunch and Sip this is basically just a fruit, veggie and water break. It’s usually taken with their little friends inside the classroom, I am told. For this, we just need to pack FRESH fruit and veggies ie, they need to be crunchy! Think whole fruit like an apple, or cut up bits of fruit and veggie sticks (like carrot, cucumber and celery). Processed fruit ‘products’ like fruit leathers, fruit bars, fruit jellies, pies or cakes are not permitted in Crunch and Sip. Some canned fruit is OK so long as it isn’t canned in syrup or jelly or with artificial sweeteners. It’s best to check with your school on this, but probably much easier to just stick with the fresh stuff. Note that dried fruit such as sultanas are allowed, but only ‘in moderation’ during this break because of the high sugar content. The main thing is as long as it’s fresh and crunchy, we are fine! The next break is recess. For this you just need to be giving your child healthy things to eat that will bridge the hunger gap between Crunch and Sip and lunch. Just make sure you aren’t packing anything blatantly unhealthy like lollies, chocolate bars or chips that will alert the lunch box police. If this happens your child may be sent home with a note saying you haven’t complied with the school’s ‘healthy eating policy’. Naughty! Think along the lines of nutritious wholefood snacks (there are some great recipes here), muesli bars, cheese sticks, yogurt, crackers with dip or cheese, a whole cooked egg, and more crunchy fruit and veggies. 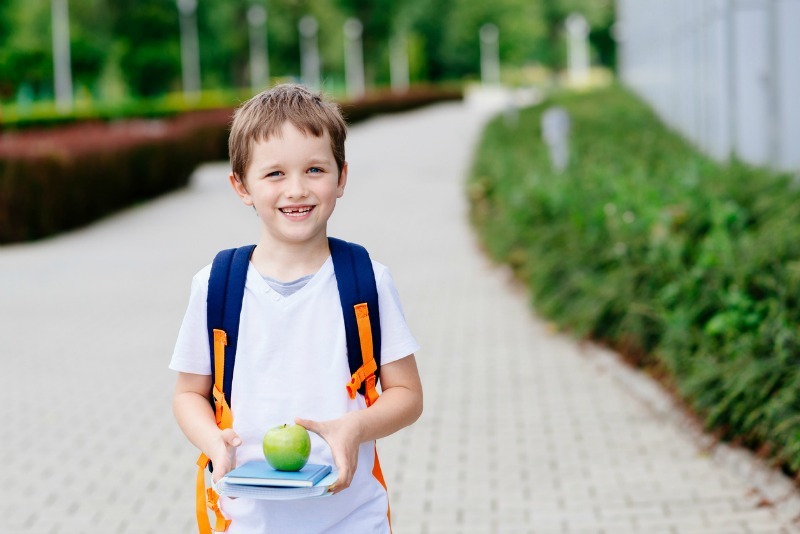 You could even give your child half their lunch and fill the rest of their box up with other things if you know they will struggle to eat a whole sandwich or wrap in one lunch break sitting. Wholemeal bread sandwiches filled with anything except for peanut butter (most schools these days are no nuts because of allergies) are always a winner. Think spreads like Vegemite but also beyond this. An avocado BLT perhaps, or a curried egg and lettuce sambo? Whatever your little one likes. You might want to add some protein, say ham or chicken, or leftover meatballs? This is where having a cooler-style lunch bag is great. Wraps are another idea, as is sushi if you can keep cold. Or pop in a homemade lunch box vegetable slice or even some samosas with humus. Good luck fellow newbie school parent. We are in this together! Happy packing!